Orange is today announcing the launch of the ALCATEL ONETOUCH PIXI 2 smartphone – an affordable, feature-packed smartphone that will rapidly bring the benefits of the mobile internet to consumers across Africa and the Middle East. This launch follows the successful launch by Orange of the original Alcatel Onetouch Pixi, particularly in sub-Saharan Africa, which sold nearly 250,000 units across 6 months, rapidly becoming the most popular smartphone in Orange shops in African and the Middle East. 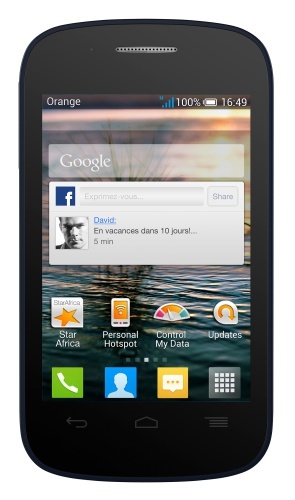 One out of every five smartphones sold by Orange across Africa and the Middle East is now an Alcatel smartphone. With the Alcatel Onetouch Pixi 2, Orange offers customers a full featured 3G Android Jellybean 4.2 smartphone with a 3.5”HVGA screen, dual-core 1.0 GHz processor, 2GB of memory and 512 MB of RAM. The sleek smartphone weighs in at 100g and is only 10.5mm thick. • Orange Football Fan Club: Easily follow the news about their favourite teams and gain access to international football news. Personalise the app in order to follow your favourite teams. In-app gaming also allows you to play and bet on matches and to win prizes. • Orange Updates: This application brings relevant and local applications directly to customers. Orange Updates offers the possibility to access the Orange apps catalogue which has been created together with local and international partners, and allows customers to download a variety of Orange apps at no additional cost. • “My personal hotspot”: Access sharing across multiple screens with only one internet connection, and simply manage connections from all devices. Through ‘my personal hotspot’, in just one click the smartphone is transformed into a Wi-Fi hotspot. • Lookout Mobile Security: Installed on every Alcatel Onetouch Pixi 2 , this app provides anti-virus protection, monitors and saves data, encrypts your confidential information, and tracks the smartphone when it is either lost or stolen. • My Orange: With ‘My Orange’, customers can stay in touch with their Orange account, following the rate of voice, SMS, & data consumption, and recharge their account. • Control My Data : Allows customers to monitor their data consumption on the mobile network, Wi-Fi network and also when roaming. Control My Data notifies customers when they reach a data limit that they choose, and allows customers to block data usage by application.